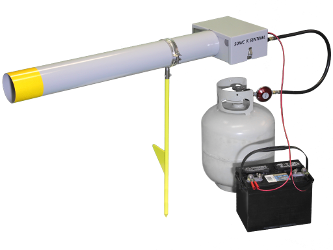 Company Overview Sonic Sentinel manufactures humane, effective deterrents for discouraging birds and other wildlife from inhabiting unsafe or undesirable locations. Preventing such occupation can help avoid costly property damage, fines, injury to wildlife, and even loss of human life. 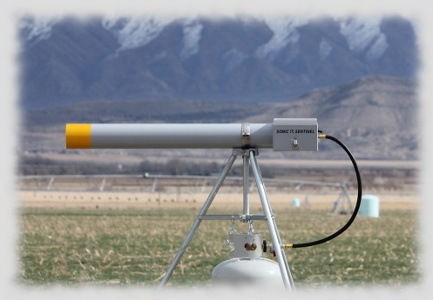 Our innovative animal control solutions are designed to specifically meet the needs of agriculture, oil and gas, mining, aviation, waste management, and other related industries that must cohabitate with protected or nuisance species. 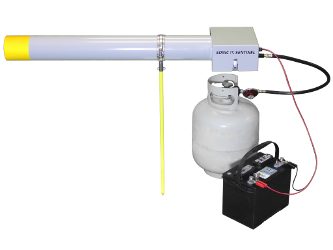 All Sonic Sentinel products are proudly designed and assembled in the U.S.A.
After many years in the wildlife abatement industry, the Sonic Sentinel team was disappointed by the lack of feature-rich, durable, low-maintenance, cost-effective, and portable propane scare cannons available. As a result, the sleek Model 14-1 cannon was designed to incorporate numerous features and capabilities not previously available at its price point, if at all. 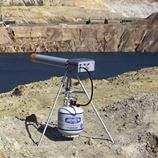 Although compact, portable, and technically advanced, the Model 14-1 cannon is rugged enough to survive the toughest outdoor climates and work environments. ★★★★★ I purchased the Cannon 14-1 for my orchard in early 2015, I have been extremely happy with the results. Great unit with easy set up from the start. unlike other units which are constantly firing this unit i was able to custom set the firing , I am still on the first propane tank and it is already 2016. The unit hardly uses propane. The Cannon keeps away birds from the orchard and blueberries patch. 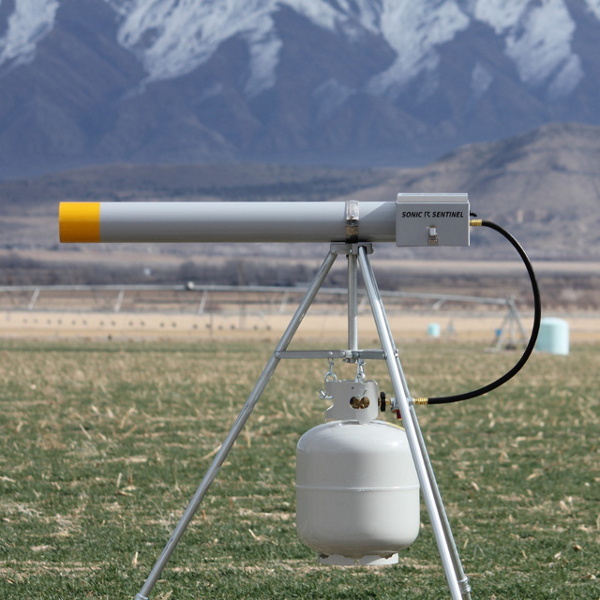 If you are looking for a orchard Cannon for your Orchard or Blueberries i highly recommend sonic Sentinel. I find the product is worth the cost. ★★★★★ The Sonic Sentinel Model 14-1 is serving our purpose perfectly, we're very satisfied with it. ★★★★★ It's always nice having a company that doesn't skimp on quality, and service. Sonic Sentintel is a company that provides a product built in the United States while contracting services from other local companies. They have a fantastic product, and their customer service is top notch. ★★★★★ Excellent products with innovative accessories that allow the user to adapt to many situations. Great customer support. Motion detection, remote control, XBee radio, etc.  03/03/2017 - Sonic Sentinel is proud to have been selected by Montana Resources to help curtail snow geese fatalities at their Berkeley Pit Mine. 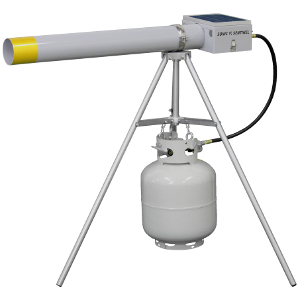 The following AP article details just one of the many ways Sonic Sentinel's products are used to save lives and solve industrial sized problems. 02/27/2017 - Please join us in welcoming a new dealer to the Sonic Sentinel family, Good Life, Inc.! They've been hard at work training their team of bird control experts to provide amazing support for Sonic Sentinel's products. 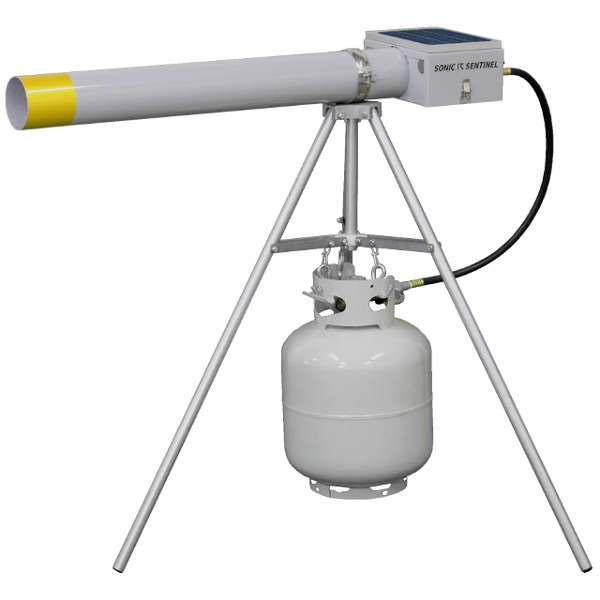 02/13/2017 - Sonic Sentinel Model 14-1 Lite Release Announcement: Looking for the same rugged durability and effective, reliable operation of our standard Model 14-1 in a cost-conscious package? Be sure to check out our brand new M14-1 Lite! 10/10/2016 - We've just added Multi-Shot functionality to every new Model 14-1! Multi-Shot allows you to select between 1, 2, & 3 shots every time the cannon fires, which can be valuable for deterring stubborn species. 08/22/2016 - Sonic Sentinel is pleased to announce the release of our new 360° Rotating Tripod accessory. Check out the below video and click here for more product and purchase information. 08/03/2016 - Check out our great new dealer, Nixalite®! These knowledgeable folks have been humane animal control experts since 1950! 07/31/2016 - Sonic Sentinel is now on Twitter, Facebook, and Instagram! Be sure to follow us for product updates, industry insight, and plenty of pics and videos of our Model 14-1 in action. 07/20/2016 - Be sure to watch our new Model 14-1 Product Information Video! Those birds are outta there! 06/24/2016 - We just released our shiny new website. Take a look around and let us know what you think! Sonic Sentinel is a registered trademark of Sonic Sentinel, LLC. All rights reserved.